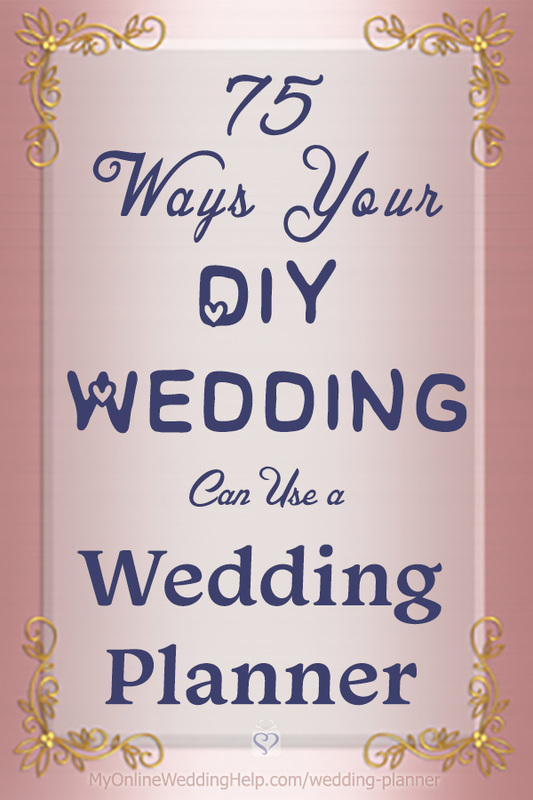 You are here: Home / Staying Within Budget / What Can a Wedding Planner Do for Your DIY Wedding? 75 Point Checklist. What Can a Wedding Planner Do for Your DIY Wedding? 75 Point Checklist. When you think of a wedding planner, you may imagine someone putting on the whole event. Planning and coordinating from beginning to end. And you may overlook the possibility of hiring one. But hold on. She can actually play a less-inclusive role. Even if you are wedding planning on a budget. So what, exactly, does a wedding planner do if she isn’t taking the responsibility for the entire event? She can play any, all, or a combination of parts. We often think of a “wedding planner” and the responsibility of “wedding planning” as interchangeable. But your planner (the person) does not have to do planning (the activity). There is a lot involved when putting on a wedding. Some activities have to do with organization, project management, and logistics. Others focus on creativity and visuals. Think of your planner’s role as having some responsibility for one or both of those two aspects. And hire one that complements and fills the holes in your own wedding planning activities. Costs adjust according to how many duties she performs. Consider the logistics of planning your wedding. The facts of who, what, when, and where. That is what being organized is about. The broadest form of wedding planning can also be the most all-encompassing. Think of the plan as your roadmap. Or a framework around which the entire event will be built. A planner’s involvement may be the whole event, covering all duties, for full-service packages. Or a specific piece of it, as in many partial-planning packages. This approach is more affordable when, like most of us, you must closely manage your wedding budget. Another way to narrow the focus is to hire a planner in the role of coordinator. A coordinator takes your plans and puts them in motion. Timelines and logistical details fall under coordinating. Directors are even more focused. They are all about guiding activities at the live event. After planning and coordinating have been done, the director takes over. In each of these roles, there are ways she can help. She can decrease the time you spend on planning and avoid a lot of stress along the way. Which, in turn, can help you prevent costly mistakes or health-related flare-ups. The first three definitions—planning, coordinating, and directing—revolve around logistical duties. Creative wedding planning professionals focus on the look and ambiance of your event. And they sweat the aesthetics. Definitions vary. Many wedding planners take on both the logistics and creative sides. And the different creative terms are often used interchangeably. Or rolled into a single service. So you may want to simplify and think of a Creative Director, Wedding Designer, and Wedding Stylist as a single person or duty. And consider the three levels of involvement related to those roles. As with a Wedding Director, creative directing is about assuring things happen correctly. But on the creative side, this involves much more than orchestrating at the live event. Creative Directors are involved during the whole creative process. From helping develop your vision. To sourcing the perfect products. And overseeing the creation of spectacular wedding aesthetics. You can think of design as a bit more focused than the directing. The designer is the one with vision. The magic that results from her mind’s eye is what makes the guests exclaim in admiration. Think of a stylist as the maker. She is quite likely the same person as or teamed with the designer. The designer’s or director’s visions come to life under her detailed implementation. After deciding which roles a wedding planner may play at your wedding, it is time to think about it from their side. The services offered. It bears mentioning again: Definitions tend to blur. So you may find titles vary for the type of service you need. Which makes finding the right planner less-than straightforward. You will find that each planner is different. Some specialize only in traditional, full-service planning. Or destination weddings. Or something else. So do not get upset or discouraged if you speak to one or more who feel they must be involved in a way you do not envision. And this is not a good fit for you. Thank them and move on. Here is the low-down on what you may expect from the different types of wedding planning services. Followed by a checklist of 80+ ways various types of wedding planners can help your wedding on a budget. Simply put, wedding consultants know stuff. This may be about specific aspects of your wedding or the bigger planning picture. A good wedding planning consultant knows the local wedding industry. She can give you advice and otherwise guide you through the areas you are most unsure about. Or, in the case of a specialist, in-depth knowledge of a particular topic. A. Show you how to get started with wedding planning. You may have a vision but no idea how to even begin. In this case, a planner can help you understand how to set up a budget and stick to it. She knows what type of vendors you may need. She can also provide you with a checklist or timeline to follow. B. Serve as a local wedding vendor guide. It can take a lot of time to find and narrow down vendors on your own. And you may end up spending more than you’d planned or getting unexpected results. An experienced planner knows what each local vendor is good at. She will be able to guide you to those most likely to have what you want within your available budget. C. Help with covering wedding details. Online discussion groups are great for asking questions and getting advice. But the answers are not always clear-cut. And may apply to different circumstances from your own. The right planner has worked through your situation before. And will be able to guide you based on that experience. This helps you avoid costly mistakes. Comprehensive packages are an option. But not practical on a budget. Your mission is to look for planners to focus on only the parts of your wedding you need. Whether that’s organization-focused, like handling the details related to your out-of-town guests. Or creative focused, like designing and assembling welcome bags. Whatever the planning roles, there are advantages. A. Serve as a point person for all involved. Fielding questions from everyone can require a lot of time and attention. Especially when you are not sure of the best answers. The planner can take that load off your shoulders in the area where she’s helping. B. Guide you through choices about details. There are a lot of decisions to be made along the way, especially when it comes to vendors. She will help you narrow down the selections to those you are most likely to want. She also has industry knowledge you lack. Because of this, she may be able to get custom services or prices you may not have gotten alone. C. Keep you on track. It’s very easy to let things slip through the cracks when you are planning everything on your own. This tendency is notorious for creating surprise costs. And extra stress. The planner will make sure you are aware of all the details within her responsibility. Doing it all yourself on the day of your wedding is like both directing and starring in your own production. It’s doable but it is a lot more work and likely to be less than dreamy. Even the best-planned events have something go wrong. Do you really want to be dealing with those hiccups? Or even directing the players? Of course not. You should be relaxed and having the time of your life. After all your hard work you want to be able to enjoy your big day. That’s where coordination comes in. Day-of wedding coordination is the most popular. The day-of coordinator usually begins her work about a month before the wedding. She can put together the schedule with a timeline. And communicate with all involved. Month-of coordination is another variation. In this case, you are hiring the planner to coordinate details leading up to the big day. As well as on the day itself. You hand over the implementation logistics to her as your planning efforts take shape. The Majestic Vision, for example, will meet with you “4 weeks before your wedding day and go over all the lovely details you have planned.” They take over finalizing all the details with your vendors and execute your vision on the big day. And serve as your “go-to” person. You do the planning work. The coordinator’s job is making the event itself go live when the time comes. She will organize the schedule before and run the show during the event. And smooth out the final details. Plus create a timeline itinerary for the big day. On your wedding day, she’ll make sure everyone is where and when they should be. This saves you potential overages or other fees resulting from overlooked tasks. You don’t even have to know about glitches that happen behind the scenes. Two types of coordinators appear similar but have very different motivations. These are (1) an on-site coordinator and (2) an independent coordinator. The former is on the venue’s payroll. She’ll let you know what’s going on with the room and any vendors they hire. She makes sure your wedding happens according to the contract. The independent coordinator or planner is on your payroll. She knows what needs to happen with your entire wedding. And she makes sure it all goes according to your plan. Remember when I said earlier that definitions can get fuzzy? Here’s a case in point. Coordinating and directing can be, and often is, consolidated into a single job description. But, depending on your situation, a director-only may be what you need. Think of a director as an orchestra conductor. Her job is to oversee the production while it’s happening. To control the pace and implementation of the production. Similarly, a wedding director keeps an eye on event activities as they happen. She is the supervisor at the live event. 80+ Ways a Wedding Planner Can Help. Even on a Budget. Now you know about the two sides of wedding planning (organization and creative). And the ways wedding planners may present their services. It’s time to think about details. What specific ways can a planner help your wedding and still keep within budget? Here is a wedding planner checklist of tasks or projects she may take on for you. Print the list and circle the ones that you need the most help with. Feel free to add your own or be more specific. 1. Serve as wedding mentor for the whole process. 2. Create a custom wedding planning checklist. 3. Consult on wedding etiquette and related decisions. 5. Help set your budget. 7. Monitor your time management to keep you on track. 8. Oversee the decorations budget and related vendors. 9. Maintain and update a wedding website. 10. Consult about pros and cons of local venues. 11. Source wedding venue locations. 12. Narrow down choices by going to on-site tours. 13. Visit ceremony and reception venues to identify problems compared to vision. 14. Do final walk-through of venue sites. 18. Consult on comparing bids. 19. Reminders to pay deposits when due. 20. Schedule and attend vendor meetings. 22. Check in on and confirm vendors’ activities. 23. Source and book entertainment. 25. Oversee wedding day activities. 26. Serve as the point person between couple, vendors, guests, and family. 27. Create a day-of-wedding timeline. 28. Develop a groomsmen and bridesmaids timeline. 29. Bridal assistance the morning of the wedding. 30. Organize snacks and drinks for wedding party throughout the day. 31. Assemble and provide an emergency kit. 32. Review and manage final details. 34. Pick up and return rentals. 35. Run other errands the day of the wedding. 37. Help with travel reservations. 38. Create a transportation itinerary for pick-ups and drop-offs. 39. Plan free-time activities for out of town guests. 40. Address and mail invitations. 42. Run hotel room reservation process. 43. Create a custom ceremony. 44. Direct the ceremony details. 45. Guide the bridal party. 46. Clean up ceremony area. 47. Source special props and equipment rentals. 49. Develop a reception seating chart. 50. Clean up after the reception. 52. brunch or breakfast for out-of-town guests. 53. the bachelor or bachelorette party. 57. Advise on popular trends. 58. Create an overall design concept. 59. Provide color palette consultation. 60. Help choose a theme. 62. Consult on styling details. 63. Ensure all the decorations are in place on-site at the wedding. 65. Consult on wedding party gift selection. 66. Assist with picking wedding party attire. 67. Set up ceremony items. 68. Decorate the ceremony location. 70. Add finishing touches to the reception room. 72. Design the dessert bar. 73. Style the head table. 74. Design invitations and other stationery. 75. Assist with invitation wording. 76. Design wedding signs, table numbers, and place cards. 78. Design, source, and assemble welcome gifts. 79. Design and assemble favors. 80. Style the rehearsal dinner. 81. Design brunch or breakfast decor for overnight guests. 82. Comprehensive floral design (bouquets and decor). 83. Develop and source a bridal shower theme. Now that you have identified the exact services that interest you, it is time to begin the search for a wedding planner to fit your needs. You can begin by looking for professionals in your area who call themselves event or wedding planners. But you may mostly find full-service planners that way. consultant, coordinator, month-of planning, weekend planning, day-of-coordination, creative director, stylist. Also, search for those that provide a la carte services. Google the individual services you are most interested in outsourcing. Finally, you can locate reputable local planners through the Association of Bridal Consultants (ABC). The organization requires all members to follow a code of ethics. Go here to find ABC members in your area. Mention “a la carte,” “partial planning,” “day-of coordination,” etc. in the other information section. Each of the above approaches can uncover the perfect gem among your local wedding professionals.